The Barbara E. Grant Award of Merit is the highest Association honor for an occupational therapist or an occupational therapy assistant in the state of Georgia. To honor an occupational therapist or occupational therapy assistant who has made an outstanding global contribution to the profession of occupational therapy in the following areas: service, leadership, education, and advocacy. The nominee must be an occupational therapist or occupational therapy assistant. The nominee shall have served as a leader within the professional and health care community, actively fostering growth and development of the profession and the Association. The nominee must be a current member of GOTA at the time of his or her nomination. Preference will be given to nominees who are also members of AOTA. Submit a nomination for the Barbara E. Grant Award now! 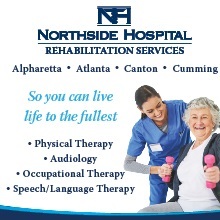 The Outstanding Occupational Therapy Practitioner of the Year Award is an award of excellence bestowed upon an occupational therapy practitioner (OTR/OTA) in the state of Georgia. To honor an occupational therapist or occupational therapy assistant who has made outstanding contributions to the profession in one or more of the following areas: practice, research, education and/or client advocacy. The nominee must be an occupational therapist or occupational therapy assistant in good standing. The nominee shall have made a significant contribution to the profession by utilizing special skills and/or knowledge in therapeutic practice, education, research, and/or administration. Submit a nomination for the Outstanding Occupational Therapy Practitioner of the Year Award now! The Outstanding Occupational Therapy Student of the Year Award is an award of excellence bestowed upon an occupational therapy or occupational therapy assistant student in the state of Georgia. To honor an Occupational Therapy Student or Occupational Therapy Assistant Student who demonstrates leadership capacity in the area of service to the profession and to professional/student associations. 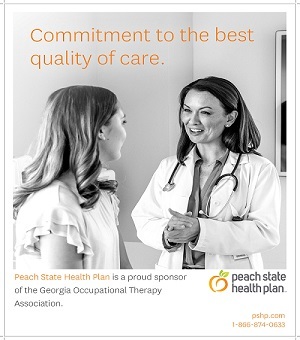 The nominee must be a registered student at an OT or OTA program in the state of Georgia. The nominee shall have demonstrated his or her commitment and dedication to the profession of occupational therapy through participation in leadership activities, advocacy for the profession, community service and/or education. The nominee must be a member of the student association at his or her respective school. Submit a nomination for the Outstanding Occupational Therapy Student of the Year Award now! This award is given in appreciation for extraordinary contributions that led to the advancement of occupational therapy and/or health promotion. To honor and recognize an individual or an organization that is not an occupational therapy professional or provider, for their support, promotion and/or advocacy of the profession of occupational therapy. Nominees shall have made a significant contribution to the advancement of occupational therapy. Their efforts may include, but are not limited to, financial contributions, political support, pioneer work, or an outstanding leadership role. Individual or organization must not provide direct occupational therapy services. Members/Organizational Members may be nominated for services or contributions that have been made clearly beyond those of normal professional duties and responsibilities. Non-Members may be nominated for services or contributions that have markedly benefitted occupational therapy. Submit a nomination for an OT Supporter here! Purpose: The Linda Stephens Scholarship was established to provide assistance to students who are matriculating in an occupational therapy program and demonstrate a commitment to serving the profession of occupational therapy. The financial amount is variable depending upon the availability of funds, which will generally be ½ of the amount in the earmarked fund. Linda Stephens’ clinical experience spanned 40 years as a practitioner and clinical educator with most of her experience in pediatrics. Linda earned her Occupational Therapy degree in 1965 from the University of Florida. In addition to owning her own pediatric practice, Linda’s career highlights include tireless involvement in the Georgia Occupational Therapy Association as well as the American Occupational Therapy Association. She was a strong advocate for OT and was instrumental in the licensing of OT’s in the State of Georgia. She also negotiated a compromise between physical and occupational therapists in the State of Georgia regarding the credentialing of occupational therapists to use physical agent modalities. She served GOTA in many capacities including district chair person, bylaws chair person and two terms as President. She served on various AOTA committees and served as an AOTA Regional Political Action Chairperson. Linda also served 8 years on the GA State Board of Occupational Therapy, and ran for the GA House of Representatives. In each of her roles, Linda Stephens humbly assumed leadership where she willingly worked in the foreground as well as the background to do “what needed to be done” in the name of advancing the profession of OT. This scholarship is designed to support students who demonstrate commitment to the occupational therapy profession and potential to exemplify leadership and passion for the field. The applicant selected will articulate how s/he envisions enacting a lifelong plan of service and commitment to the field of occupational therapy. Nominations for this award can be submitted at any time during a calendar year. Who (how) will make final determination? Committee members will individually rank applicants according to criteria (see ranking form provided). These individual scores will be tallied and averaged to determine the applicant to receive the Linda Stephens scholarship. Confidentiality of application materials: all information submitted will be maintained on file by the committee for one (1) year.